Wandsworth Council leader Edward Lister is to take over as the Mayor of London’s chief of staff and deputy mayor at City Hall. He steps down as Council Leader since 1992 and as a councillor for 35 years of which he has spent 33 years as a Thamesfield councillor. The ward runs from Point Pleasant in Wandsworth Riverside Quarter to Putney Common and from the Thames up to Upper Richmond Road. This is what Cllr Lister had to say of his time at Wandsworth and his new role. I am especially proud of the reputation that Wandsworth has earned for high quality services and the lowest Council Tax in the country. I was delighted to have played my part in building the London-wide alliance that defeated the last Government’s Heathrow expansion plans. We are currently battling with Thames Water to head off their plans for Barn Elms – another threat to our much-cherished Putney environment and indeed all riparian areas – and hopefully seeing the fruition of redevelopment plans in Nine Elms, including the American Embassy, regeneration of the Power Station and the Northern Line extension into Battersea. I hope the work we have begun in Tooting’s town centre will continue and likewise prove transformative for the area. We have seen major changes in recent years, particularly on the riverfront where the new developments at Putney Wharf and Riverside Quarter have transformed former industrial areas. Not all of these were popular at the time but they have brought life to previously closed-off parts of the riverside and, in creating new places to live, have enabled us to welcome many new residents to our community. My new job prevents me from remaining a councillor. If there had been any way in which I could have carried on serving the people of Putney and Wandsworth in the capacity I have done, I would certainly not be leaving. It does of course mean there will be a by-election in Thamesfield ward and the chance for a new councillor to take on the immensely rewarding job of representing local people at the town hall, working hard on their behalf alongside Jim Maddan and Rosemary Torrington sticking up for the interests of Thamesfield residents. I am incredibly proud to be following in Sir Simon's footsteps and excited to be joining Boris's team at City Hall. This is a great time to become involved in the running of London. It's uniquely placed to attract investment in new development that will improve the quality of life for Londoners”. Cllr Lister is also a leading champion for Localism. Before last year's General Election Cllr Lister co-authored 'A Magna Carta for Localism' with the leaders of Westminster and Hammersmith and Fulham councils setting out policy options for the new Government. 'Magna Carta II', which will be published next month, will develop the case for financial freedoms for local government. A large number of candidates resident in Putney put their names forward as prospective Conservative Thamesfield councillors. Mike Ryder has been selected to stand in the Thamesfield by-election which will take place later this summer. Mike knows the ward well having lived in Thamesfield for 30 years. He is married and his wife in a Neighbourhood Watch co-ordinator. By profession he is a journalist and travel writer. He has held executive and managerial positions for most of his career. He has a particular interest in licensing which is especially relevant in Thamesfield. Mike is a keen supporter of Action Aid and has sponsored children in Kenya for many years as well as supporting children in the UK cared for by Dr Barnados and National Childrens Homes. Cllrs Maddan and Torrington are delighted to welcome Mike and look forward to working with him in the run up to the by-election. The initial report by Thames Water into the proposed Thames Tideway Tunnel has been published and it is evident that the residents of Putney and Barnes have been most vociferous. Throughout the period between mid-January 2011 when the initial consultation finished and the present time Wandsworth Councillors, the Members of Parliament for Putney and Barnes, and officers from both Wandsworth and Richmond Councils, have been meeting regularly with Thames Water, who have indicated that they fully understand the concerns of the local residents. Justine Greening MP for Putney has established a working group which meets every four or five weeks. Thames Water has agreed to fund a part-time consultant to closely examine the proposals. Sub-groups have also been established to look at the various sites within the constituency which are affected. Work in this area continues. A brownfield site in Carnwath Road, Fulham, has been identified as an alternative to the greenfield site of Barn Elms, which was the original proposal. The potentiality of this site is being actively pursued. If this site gets the green light, it will mean two sites will remain in Putney. A new smaller site will still be required in the Barn Elms area to facilitate the connection of the Combined Sewer Overflow (CSO) at Beverley Brook into the main sewer, and there is no getting away from the need for a similar site in the vicinity of Putney Bridge, to allow the connection of the CSO, which is right under the bridge, into the sewer. As regards the latter site, Thames Water have conceded that all spoil and materials will be transported by river and not by road where possible, that the ‘stink’ pipe will be three metres high from the riverbed and not ten metres as previously speculated. Stink pipe is a misnomer as there is no smell emanating from it. It should be called a ventilation pipe as it prevents the build-up of fumes. Thames Water have also agreed to the construction of a new slipway for the launching of business craft and emergency evacuation, that there will be a legacy of new gardens where Watermans Green currently is and to explore the idea of putting some of their machinery in the underground vaults under Lower Richmond Road and Putney Bridge Approach. We will continue to report back on this issue. Work to get a good deal for the residents of Thamesfield continues and we will not be slackening off the pressure in the weeks and months ahead. Justine Greening and Zac Goldsmith MP for Richmond are planning a family fun day on Barn Elms to be held on Saturday 16th July 2011 with the tag line ‘I love Barn Elms’. For many years the Putney Hospital site has lain dormant. Plans to create a primary care centre were deemed inappropriate by NHS London and in the latter part of 2010 Wandsworth Primary Care Trust declared the site surplus to requirements. Wandsworth Council was deemed to have a preferred status as a potential bidder and since that time negotiations have been under way between the PCT and the Borough Valuer to determine a valuation of the site. Those negotiations are now in the final furlong of what has been a real marathon. Once the negotiations are concluded, a decision will be made as to the use to which the site will be put. 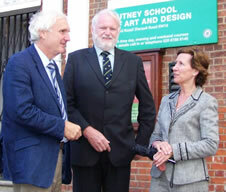 Thamesfield has an acute shortage of primary school places and many people believe that the site, adjacent to Putney Common, is ideal for a new primary school; however no decision has been made. As soon as a decision is reached we will make that known throughout the ward. For several years leaking water from within the Putney Bridge structure has been causing problems to the carriageway and bridge waterproofing. There are six major Thames Water Utilities (TWU) mains running within the Putney Bridge. The water leaking from the bridge is not weather dependent, i.e. even in the dry summer period in 2006 water was seen flowing from the bridge which suggests that the origin of the water must be from the TWU water mains. However, TWU have maintained that this that the water causing damage and seen from within the bridge is not TWU freshwater, due to the lack of chlorine in most of the samples taken. They suggested that this infers that the problem is caused by rainwater. • TWU have confirmed that their current leak-sensor testing programme is complete; six water main pipes have been tested and four leaks identified. Two of the leaks have been investigated and repaired. The remaining two locations are on the Hammersmith & Fulham side of the bridge and have been scheduled for investigation and repair by TWU within the next 4 week period. • It was noted that 3 water mains (the 18”, 12” and 24” number 3) are not currently in use and have been capped on the northern side of Putney Bridge, but remain under full pressure across the bridge to supply water in the event of maintenance problems or emergencies. TWU advise that it is not possible to cap these pipes on the southern side of the bridge as without pressurised water, these pipes would be liable to contamination and therefore would have to be tested and possibly decontaminated before being brought into use. • TWU confirmed that as monitoring access equipment is now in place, a regular 6-monthly monitoring programme has been agreed for these water mains, which will enable TWU to take a proactive approach to addressing water leaks. TWU also assured the council that should there be future concerns regarding leaking water in the Putney Bridge structure, further testing can be arranged within 2 weeks notice. The Council will now programme carriageway redesign and reconstruction to address the damage caused by the leaking water. It is anticipated that this will be undertaken later this year following the initial trial Olympic Cycle Race in August 2011. The organisers of the cycle race have said that they will only require the middle section of the bridge and the necessary interim repairs will be made. This year’s Wandsworth Arts Festival offers more than 45 events planned in venues right across the borough. The festival has something for everyone including spoken word performances, theatre, visual arts, dance and exhibitions by visiting and local artists. The festival's final event The Shimmy takes place in Putney. The shimmy is an afternoon of eclectic outdoor arts activities all along the riverfront from Wandsworth Park, down Deodar Road and in Putney Wharf on May 22 from 1-5pm. There will be a promenade of performances, installations and workshops for the family at nine different locations all along the route. and is available in libraries and other local venues. Several events take place in Putney venues such at the Exchange, the Library, the Green Man and St Mary’s Church. The map can be downloaded at www.wandsworth.gov.uk/downloads/file/4305/wandsworth_arts_festival_2011_festival_map. For further information contact the arts team on 020 8871 8711 or email arts@wandsworth.gov.uk. Putney Verse workshop takes place on 22 May between 4 and 6pm at the Cats Back pub with a topic of “cats & dogs”. Engineers working for Southern Gas Networks are replacing a major gas main on the south circular between East Putney tube station and the junction of the Upper Richmond Road and West Hill. The works are scheduled to last some 16 weeks and are due to finish in the first week in September. Putney is likely to experience heavy traffic congestion. During the works Upper Richmond Road is 'one way only' between the tube station and West Hill for vehicles heading east. Drivers travelling westbound will be diverted via West Hill, Tibbets Corner and Putney Hill. TfL will also be arranging for a signposted cyclist diversion route via Putney Bridge Road, Fawe Park Road and Oxford Road. The borough’s heritage festival is launched on 24 May at 6.30pm at the Festival Pleasure Garden in Battersea Park and continues with a fascinating programme of events until 12 June. Of particular note in Putney is the Roundheads and Cavaliers pub crawl quest on Saturday 4 June from 5-8.30pm. The quest is in aid of the Royal Hospital for Neuro-disability in Putney. It’s 1647 and The Putney Debates are in full swing. King Charles I is hiding in a Putney pub. You have from 5-8.30pm to find him, and solve the issues of the English Civil War, visiting 9 pubs starting at The Star & Garter on Putney Embankment. Teams of 4 are invited to take part. To sign up email sales@thestartandgarter.com or call Jesse Hartshorne on 020 8788 0345. The entry fee per team is £5. Following queries from residents we can assure you that both these playgrounds will remain free. It is evident that what has been built does not comply with what the residents were expecting and what they had been lead to believe would be constructed. Local councillors are tackling the issues which have been raised and are in regular contact with the residents, the planning department and council officers in the Children’s Services Department. It is hoped that a satisfactory solution can be reached to what is an entirely unsatisfactory situation. The cycle race event scheduled for Sunday 14th August 2011 is effectively a test event for next year’s two Olympic cycle race events to be held on the same course on Saturday and Sunday 28 and 29 July 2012. This test event will be for men over the 140km course, which will be the women’s course for the Olympic event. The men’s course will be 250km and involve more circuits of the Box Hill section to make up the required distance. We will report with further news. The Council is about to carry out emergency street tree maintenance works which includes the removal of diseased and dead trees. All street tree sites that become vacant due to tree removals out under routine maintenance or emergency works are automatically added to the list for replanting. Residents can now recycle a wider range of plastic food packaging. The opening of the Western Riverside Waste Authority's new recycling plant at Smugglers Way means that plastic bottles, pots, tubs and trays can now go in orange sacks and orange-lidded recycling bins. This has been welcomed by the council, because it cuts rubbish disposal costs, and saves council tax payers' money. Please remove all plastic tops from bottles and plastic film from food containers as well as any excessive food residues. Young people and their parents and carers can enjoy an array of fun activities in the May half-term holiday as part of National Family Week. The nationwide initiative celebrates family life by highlighting the importance of quality time together and promoting the benefits of a healthy, active lifestyle. The Environment Agency will begin flood defence works at Ashlone Wharf in the next few weeks. Work starts in early May and lasts until the end of the year. Ashlone Wharf is a flood defence structure which manages the flow of water between Beverley Brook and the Thames. The wharf, which is located to the south of Barn Elms Playing Fields, is in a poor condition and requires urgent repairs. Engineers anticipate the gates would completely fail within the next few years if no action were taken, exposing more than 450 homes to the risk of tidal flooding. Environment Agency latest newsletter has full details. Master Class Sunday on 22 May from 10am to 4pm. There is a permanent exhibition about The Putney Debates 1647 in St Mary’s Church by Putney Bridge open Monday to Saturday from 10am to 4pm www.putneydebates.com. Felsham Road recycling bank you can now recycle cardboard, food and drink cans, mixed glass, plastic bottles, food & drink cartons and newspapers & magazines behind TK Maxx. Any residents, and particularly those who live in a flat with limited space to store orange sacks, can deposit the above items in the recycling facility throughout the week. As it is a residential area the recycling bank should be used ONLY BETWEEN 8AM AND 8PM.